I found two photos of Hamilton from the 1880s held at the State Library of South Australia. They were going to be the only subjects of this post, but as usual, I couldn’t stop at that. 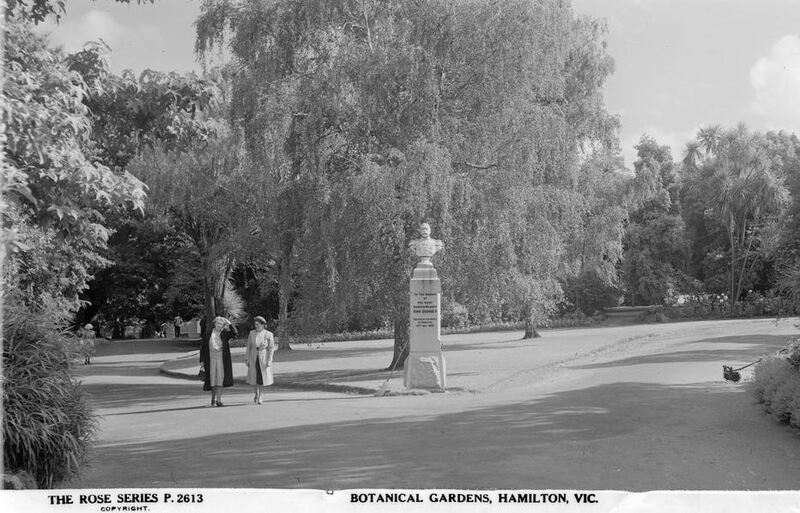 With the help of Trove, Google Maps and some of my own photos, we can look at Hamilton then and now. 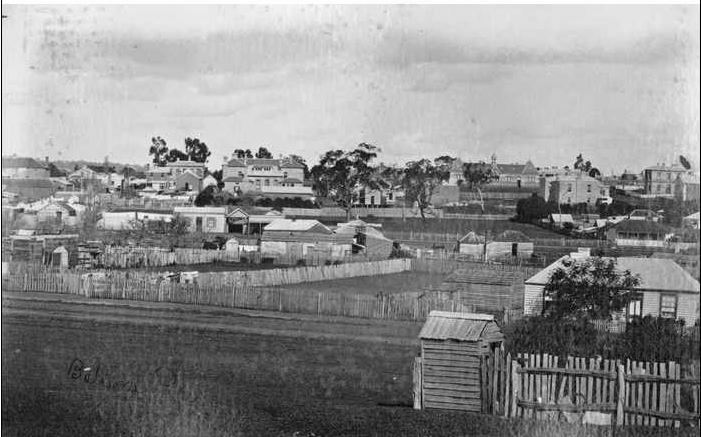 The first photo, probably taken from around Scoresby Street, looks toward what is known as Church Hill. 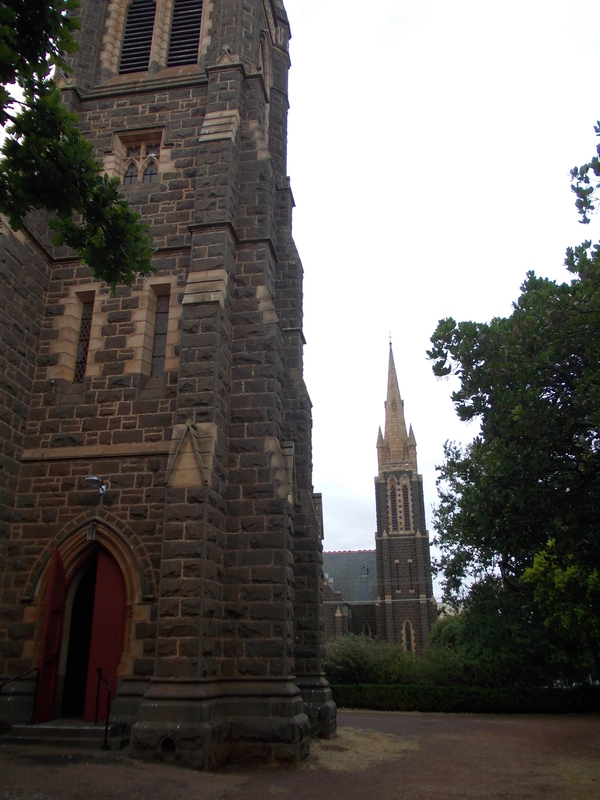 On the left is the Christ Church(1868) and the right, St Andrew’s Presbyterian Church (1858). 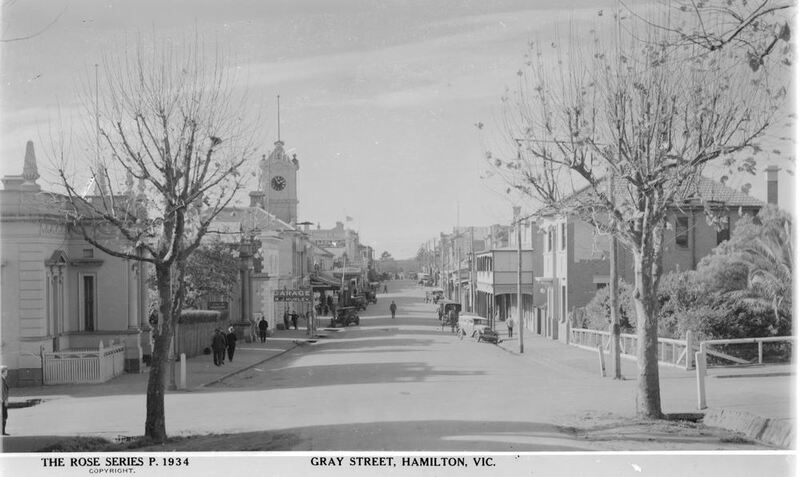 The photo tells so much about Hamilton in 1880, the buildings, the style of houses, and roofing materials. Even what the ladies were wearing. I wonder what they were talking about? The shot from Google Maps shows how densely populated this part of town has become over the years. The year 1880 was an eventful one in Hamilton. From the Maitland Mercury & Hunter River General Advertiser, of February 14, 1880, comes a story from The Hamilton Spectator of February 7. Two days earlier, the Shire Secretary, Henry J. Bloomfield and a local storekeeper J.H. Cooke had a public fight that ended with the firing of Cooke’s revolver. The evening before, Cooke had been horsewhipped by a female relative of Bloomfield. Scandal. Maybe that was what the ladies were talking about. In September 1880 The Duke of Manchester visited Hamilton. Met at the station by a large crowd, he went on to give a speech at a packed Commercial Hotel. 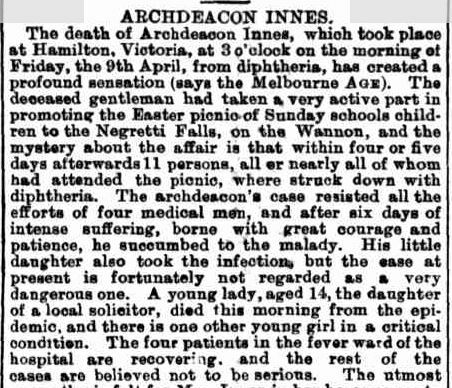 The event that caused “a profound sensation”, not just in Hamilton but beyond, was an outbreak of Diphtheria that lee to deaths including that of Archdeacon Innes. An inquiry was held, as reported in the Evening News (Sydney) with the finding that the disease had originated in nearby Hochkirch (now Tarrington). Several children had died in that town, but because of a belief that disease was not contagious, it was able to spread unchecked. It was then transmitted to Hamilton and the result was the death of the Archdeacon and others. Back to the churches. 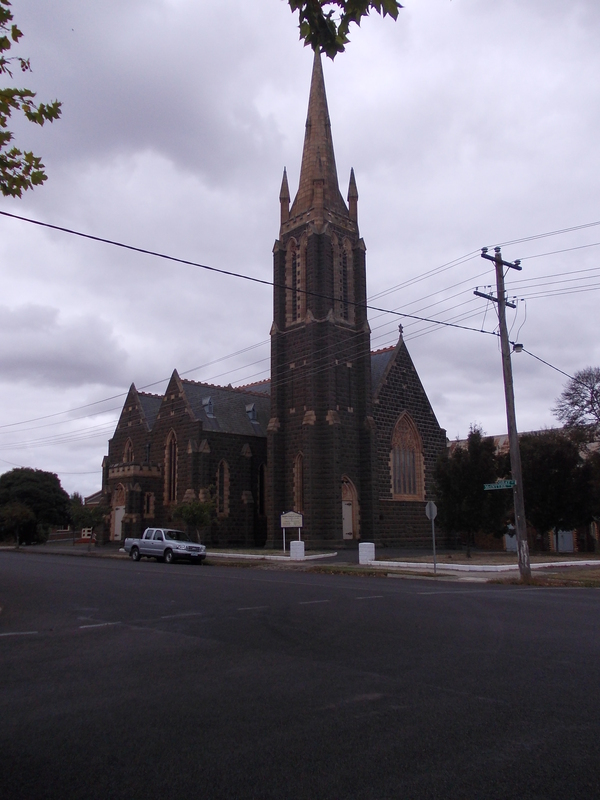 In the early 1900s, the St Andrews Presbyterian Church was pulled down and a new church built. 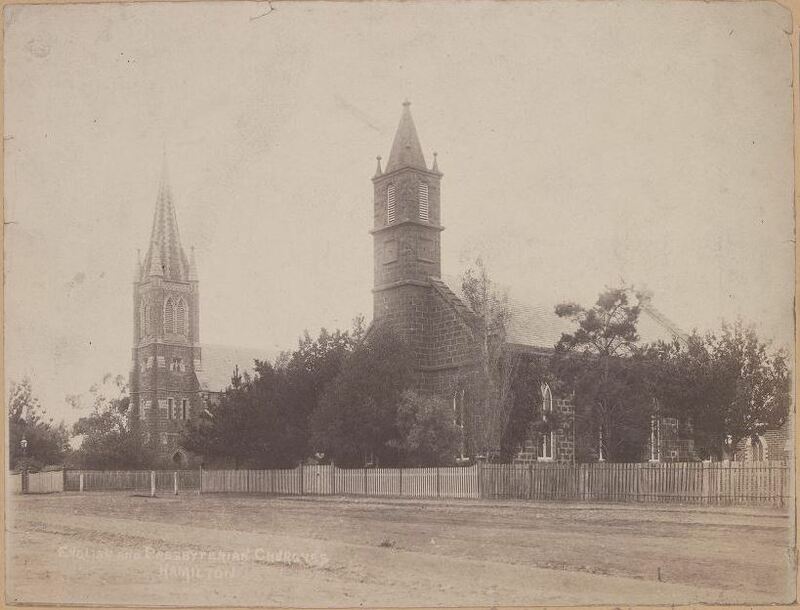 The following photo of the original church is from 1890. Today the two churches stand tall on Church Hill, their steeples visible from many parts of town. Below is the Christ Church in the foreground and St Andrews in the background, taken in 2012. The “new” Presbyterian Church as seen in 2012. The following photo, from 1880, was taken a little further east to the earlier shot, presumably by the same photographer. The Gray Street Primary School, then the National School is seen in the top right quadrant. 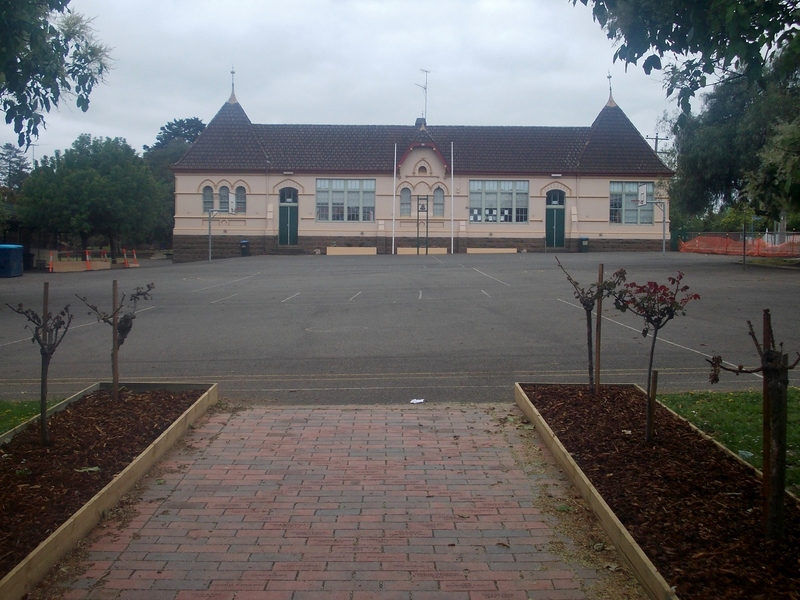 The current school was built in 1876, four years before the above photo, replacing a small wooden school built in 1852. The photo from the 1880s shows a turret on the centre of the school roof. It is no longer there as seen in this photo from 2012. I wanted to identify more of the buildings in the second 1880s photo, particularly those on the extreme right, near the school. It is difficult to work out where Gray Street actually was, but taking into consideration the great depth of the schoolyard, I was able to establish that the building closest to the school is Hewlett House (below), on the corner of Gray and Kennedy Streets. The three windows on the upper level of the building are visible in the original photo. The home was built in 1876 by Dr Viallis, but he died in 1879 aged 32. 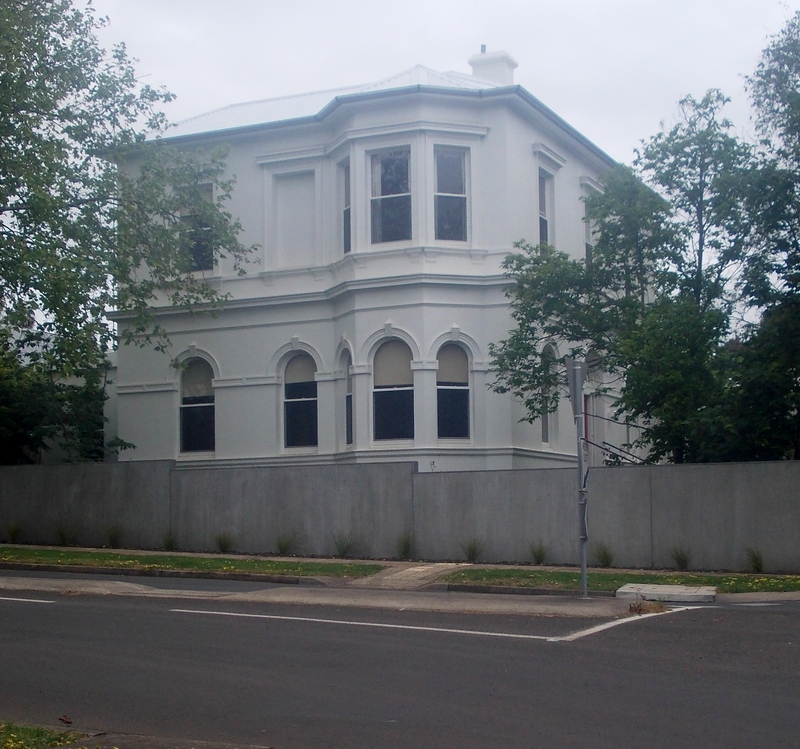 The building to the front of Hewlett House must then be the former Temperance Hall in Kennedy Street built, 1876. From Google Maps, a snap of the building in more recent years. In the 19th century, the western end of Gray Street was the epicentre of town. The Town Hall, Post Office, National School, Mechanics Institute, The Hamilton Spectator and the Hamilton Club were all is this small section of the street. The photo below is from a Rose postcard. The postcard collection I found doesn’t have specific dates, only the general date range 1920-1954. The Hamilton Club, built in 1876 is the first building on the left side of the street. Opposite is the school, by then Gray Street State School. The building next to the school, was demolished in 1986. 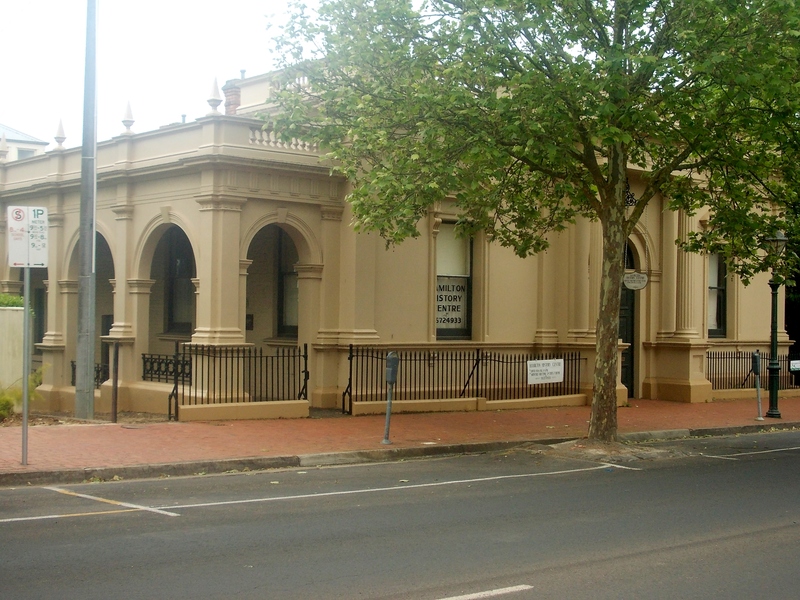 It was the State Savings Bank of Victoria at the time of the photograph. 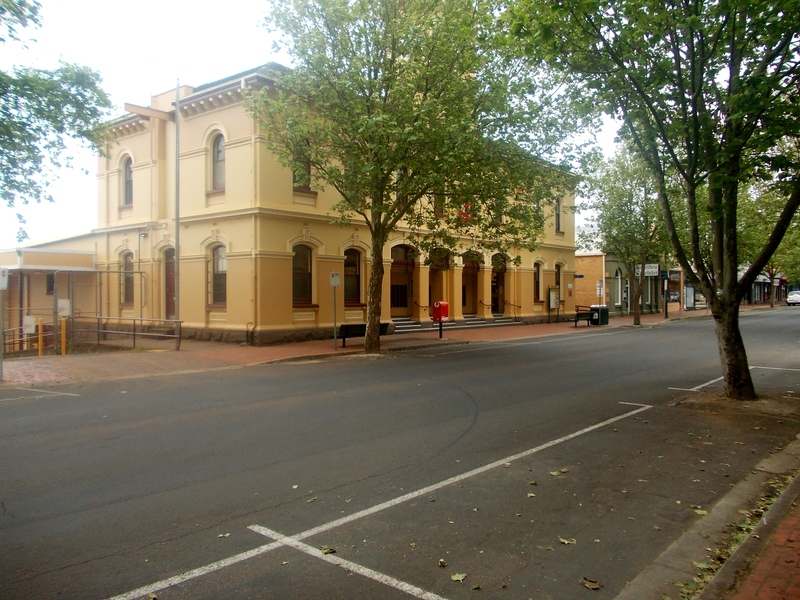 Further on, the building with the enclosed verandah would be the former Town Hall Hotel. It was later known as the Hamilton Hotel and today is the home of the Hamilton Baptist Church. Below is the Hamilton Club as seen in 2012. 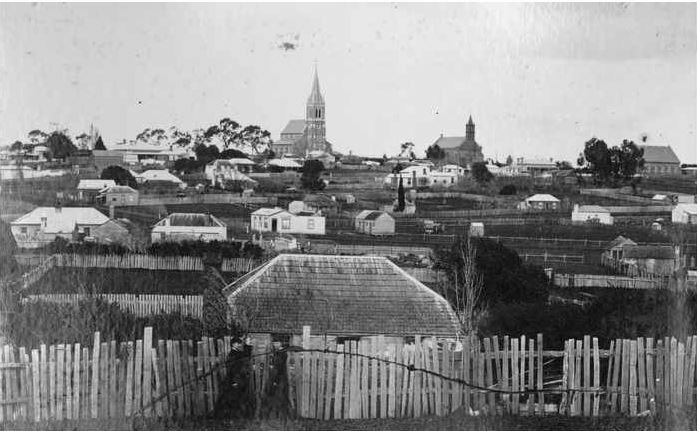 In the original 1880s photo, a fence and hedge runs between the Hamilton Club and the next building, the Mechanics Institute, built 1865. It is now the home of the Hamilton History Centre. 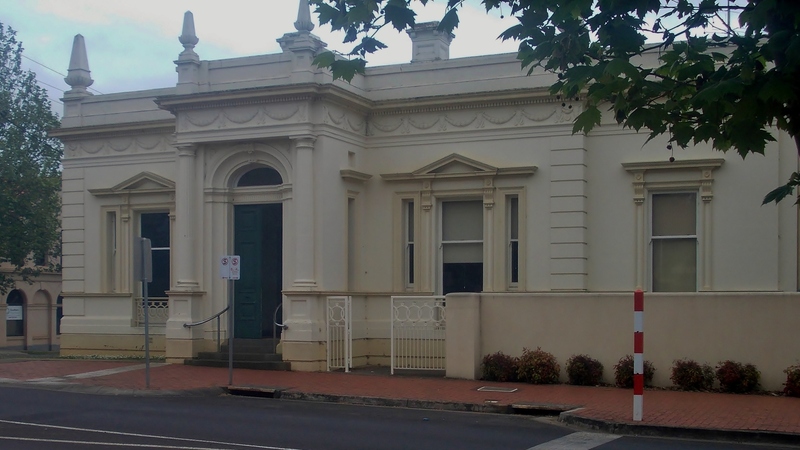 HAMILTON HISTORY CENTRE, FORMALLY MECHANICS INSTITUTE. Further on from the Mechanics Institute, in the original photo, there is a “Garage” sign. This was the former Town Hall, built 1873. A new Town Hall was built in Brown Street in 1909 and the original building sold. In 1969, the building was demolished and is now a car park for postal employees. 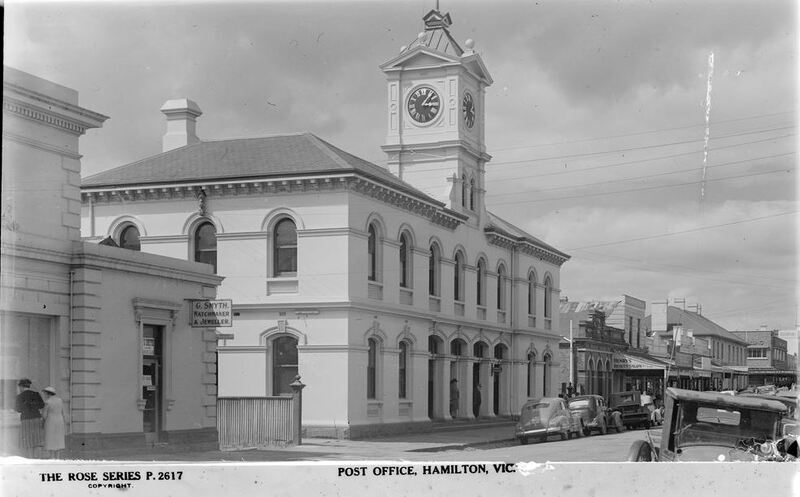 The Hamilton Post Office was built in 1878 and the clock tower added in 1890. The Hamilton Spectator office is further along the street. The Post Office clock tower still exists, it’s just obscured by a plane tree. The Hamilton Spectator office, below, in 2012. George Robinson established the paper in 1860. Robinson built the current home of the Spec in 1873. 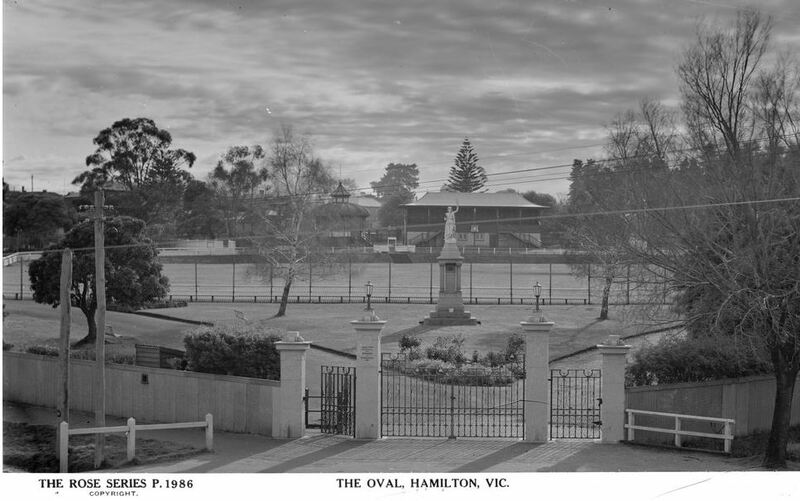 Below is the front of Melville Oval from a Rose Postcard sometime after WW1. 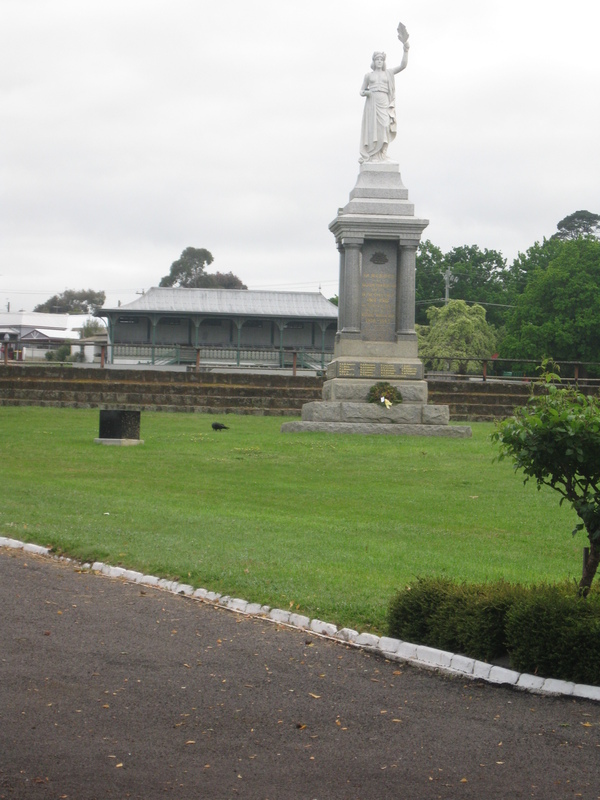 The War Memorial is in the foreground, grandstand in the background and a band rotunda to the left of the grandstand. Below is a similar view from 2011. The band rotunda is no longer beside the grandstand. It found a new home in 1988. The Hamilton Botanical Gardens is one of my favourite places in Hamilton. This is the view from the entrance on the corner of Thompson and French Streets. 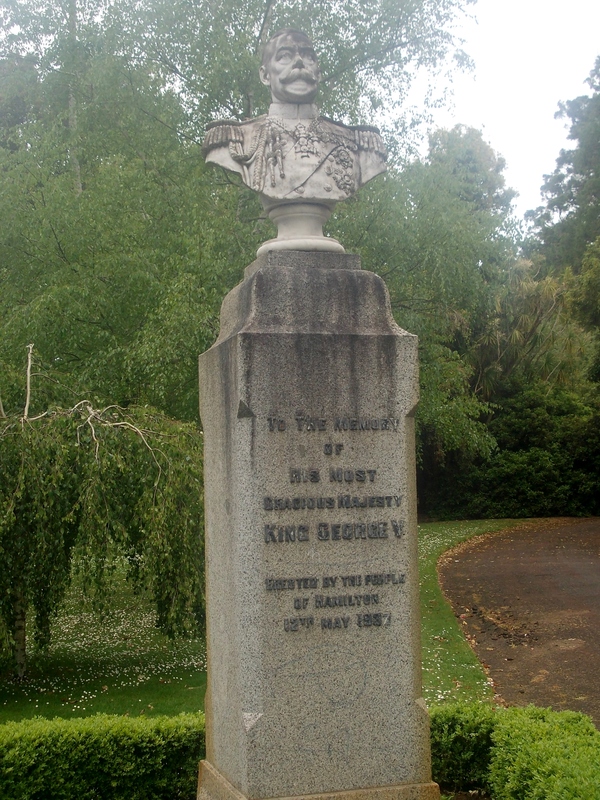 The bust of George V was erected after the King’s death in 1936. This is George today. If only he could talk. He would have seen some sights in his 70 or so years in the gardens. 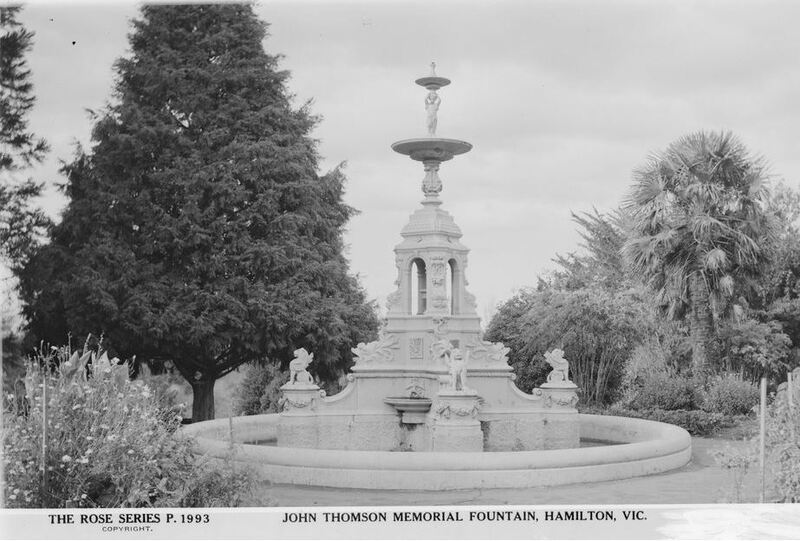 The John Thomson Memorial Fountain was erected in 1919 in memory of the pastoralist and MLA. John Thomson. Thomson was a member of the Racing Club, Presbyterian Church and the Fire Brigade and more. 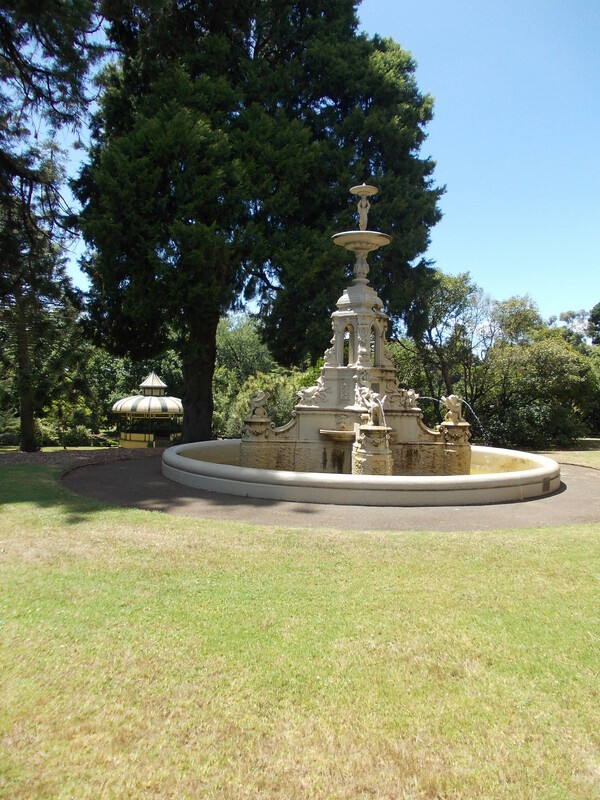 The fountain today, with the band rotunda, formally at Melville Oval, in the background. Relocated in 1988, the gardens are a perfect spot for it. This post was so much easier thanks to several booklets I have, written by Margaret Gardner and Val Heffernan of the Hamilton History Centre. 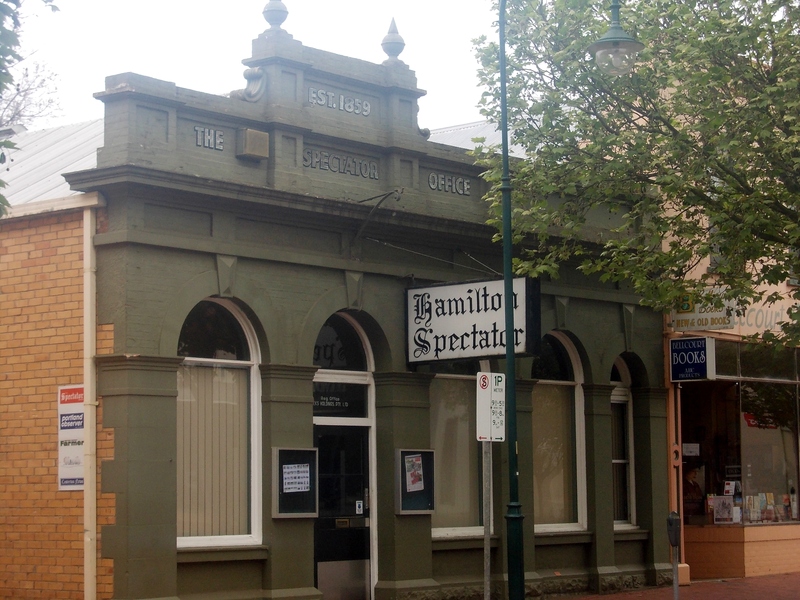 Under the general title of “Exploring Hamilton” they offer several walking and driving tours of Hamilton packed full of history and include the Church Hill walk, CBD – Gray Street walk and the Grange Burn walk. There are histories of prominent landmarks, shops and homes. There are eight walking tours and three driving tours in total and are available from the Hamilton History Centre for $5.00 each. I have six so far and they are a wonderful resource. This entry was posted in Trove Tuesday and tagged Hamilton. Bookmark the permalink. It is wonderful that so many of the old buildings are remaining. I think I may need to arrange a visit to Hamilton at some stage in future. You will have to visit Sharon. You could also tie in Portland and Port Fairy. Both well worth a visit also. all that magnificence built on the golden era of the sheep/wool industry. The Hamilton Club building has a lovely verandah at the rear which has A View. and what a triumph for the Baptists that they turned that hotel into their church. Thanks again MR for the pleasure and the learnin’. 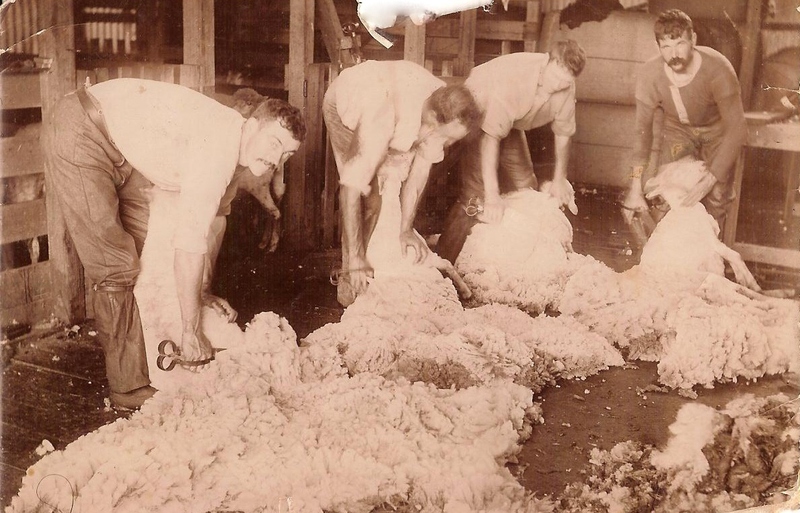 Now Southern Grampians shire want to remove wool from their branding. I know the house in Lonsdale Street well. Mum does too and said it was always well kept when she was living in Hamilton. I suppose it is lucky to have survived this long. I used to go to school at the Monivae Jnr school in Clarendon Street and know that area well. I found out that my gg aunt lived at 82 Cox street near the intersection of Lonsdale Street but when I went back there to look at the house, all the houses in Cox Street from Lonsdale to Clarendon Street were gone and the block is still bare! The transformation of the hotel to the Baptist church brought much amusement to my peers that frequented the Hamilton Hotel in the late 1980s.